Antony Ingram September 9, 2014 Comment Now! The number of drivetrains available to car buyers has never been so diverse. 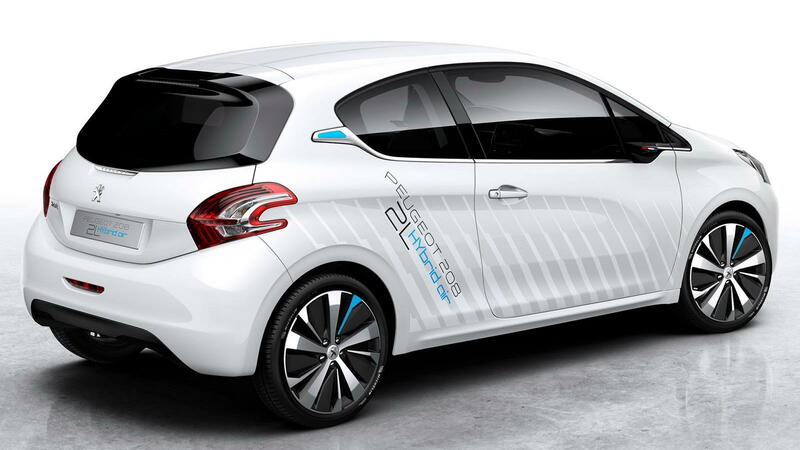 Gasoline, diesel, natural gas, electric and all manner of hybrid vehicles are available right now—and French automaker Peugeot intends to add to the latter with its innovative 'Hybrid Air' technology. Peugeot together with its sister brand Citroën has showcased Hybrid Air before, but will do so again at the upcoming Paris Auto Show with the latest version of its 208 subcompact. 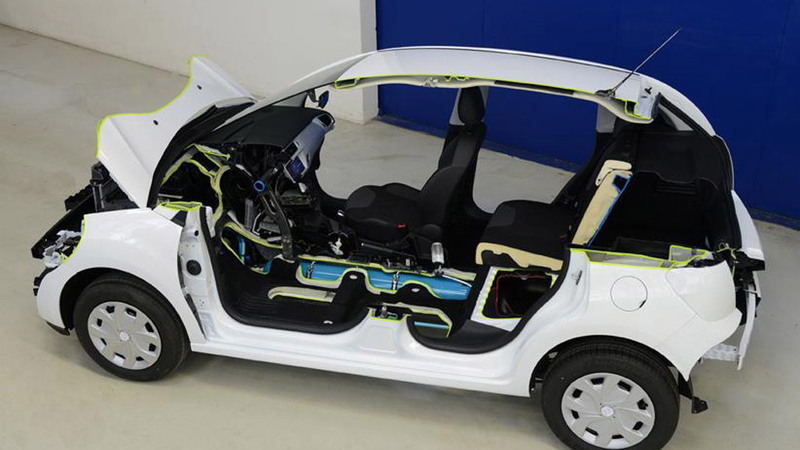 The aim is to produce a car to hit the French government's target of 117 mpg by 2020 (equivalent to 2 liters per 100 km), and Hybrid Air tech promises to do so without adding significant cost to the vehicle as a traditional hybrid setup would. In effect, compressed air fulfills much the same role that a battery would in a regular hybrid. As you drive along or decelerate, hydraulic motors compress air into two tanks mounted under the trunk floor—a process that takes as little as ten seconds. When you need to accelerate again, air pressure spins the hydraulic motors, the power of which is then sent through an epicyclic transmission to assist the gasoline engine—in this case, a 1.2-liter three-cylinder as found in standard Peugeot 208 models. It's possible to drive the car on air power alone for brief distances. The engine itself has been tweaked to reduce friction, while Peugeot has also revised the bodywork slightly to reduce aerodynamic drag. Air intakes have been redesigned and it wears slim, aerodynamic mirrors to help the small hatchback cut through the air. Large alloy wheels feature smooth facings further aiding aero, while Peugeot has sliced a full 220 lbs from the weight of a standard (and already lightweight) 208, resulting in a curb weight of under 1,900 lbs. Composite panels and use of aluminum in the structure helps reach this goal. If it works as well as Peugeot says it does, the improvements are huge. The standard Peugeot 208 1.2 PureTech is hardly profligate with a 52 mpg combined figure, nor is its 104 g/km CO2 rating particularly high—but 117 mpg means drivers could go twice as far on every gallon of fuel (without the need for a heavy, expensive battery pack) and emit just 46 g/km as they roll along. 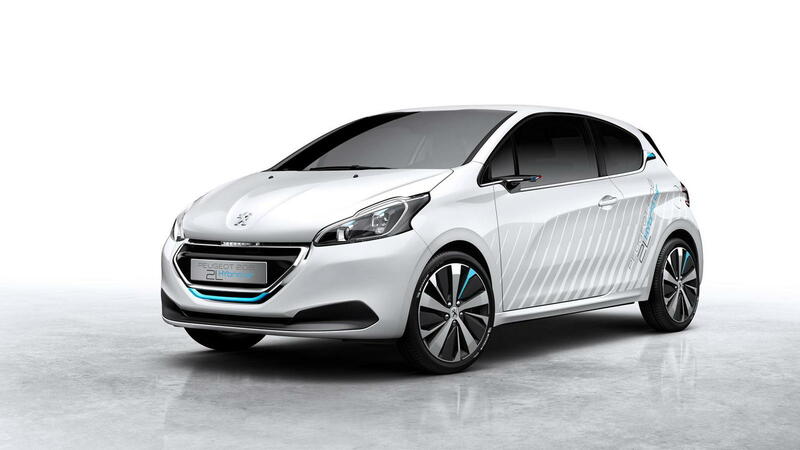 The Peugeot 208 Hybrid Air concept makes its debut at the Paris Auto Show on October 2. For more of our coverage on the event, head to our dedicated hub.